Rather than deal with multiple Army Corps of Engineers District Offices, let Pilothouse be your one-stop shop. We can supply any ACOE chart book, including those ACOE has allowed to go out-of-print, which we obtain in Print-on-demand. The Atchafalaya River is located in central Louisiana. The approximately 170 mile river is fed by the Mississippi and Red Rivers, which are connected via the Old River Lock. Navigation is therefore reduced by almost 172 miles for vessels sailing between the Mississippi above the Old River Lock and the Intracoastal Waterway in southern Louisiana saving time, money, energy and reducing river traffic congestion near the Port of New Orleans. 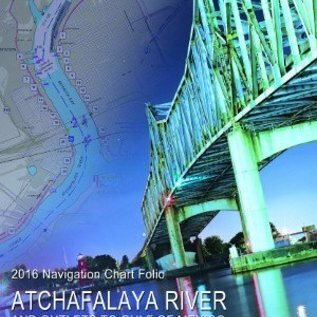 The Atchafalaya River is a natural outlet for the Atchafalaya River Basin and it is the only riverine area building new ground near the Gulf of Mexico. The U.S. Army Corps of Engineers (USACE) is responsible for providing data pertaining to navigation on and along the river. 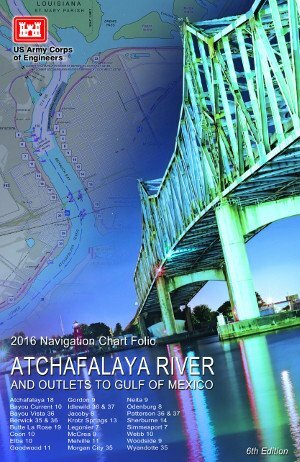 As part of a comprehensive mapping project, the USACE develops updated flood control and navigation maps as well as hydrographic survey maps for the Atchafalaya River.